Our fall landscaping chores aren’t really complete unless we’ve planted bulbs that will show up as early spring flowers next year. When they pop up through the snow they tell us the winter doldrums are over and another growing season is about to begin. While the weather is still nice, it’s a perfect time to do this last chore. Look for a place in the yard that will showcase these first flowers of spring not only for you, but also the neighbors and others who pass by. Spring color – or any seasonal color – should never be hoarded. Once you know where you’re planting, select varieties of plants you want to see. Tried and true flowers include tulips, daffodils, hyacinth and crocus. Add edibles to the mix by planting garlic and saffron crocus. Next, determine the bloom times of each type of flower so you can group and plant them accordingly. Daffodils and crocus are early bloomers. 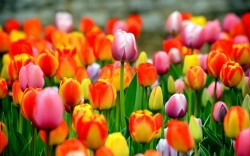 Depending on the variety, tulips can have 3 different bloom times. Select locations that are well drained and get plenty of sun. Plant the bulbs as soon as possible after you buy them. Group bulbs by bloom time and create pockets of bulbs within the planting beds with a grouping of 7 or more bulbs if space allows. When bulbs bloom as a group, they will have much more visual impact than if planted separately or in a row. You can plant bulbs one at a time with a special bulb tool or spade, but a more efficient practiceis to dig a hole or trench large enough for each group of bulbs. Dig the hole 3 times deeper than the bulb height. Place bulbs in the hole spacing bulbs about twice their width from the next bulb. Place the pointed ends, which are the tops, up. If you can’t tell top from bottom, place bulbs on their sides and the shoots will naturally grow up and the roots will grow down. Once all the bulbs are in place, re-fill the hole with the soil. Fertilize according to label directions with a product high in phosphorous – a super phosphate. It’s better than bone meal. When planting hyacinths, wear gloves as touching them with bare skin sometimes causes a rash. After planting, top dress the beds with shredded wood mulch. During the dormant season when less food is available, wildlife will dig up bulbs for a meal. If wildlife likes to raid your yard, here are some tips to safeguard your bulbs. Discourage deer, elk and rabbits from digging up bulbs by treating them prior to planting with a hot pepper product available from garden centers. As an added precaution, place a wire cage made from chicken wire over the bed. Bend flat wire to create cage’s sides that can be pushed into the ground. Voles are a common landscape pest that actively forage during the winter. To discourage them, apply at least 2 inches of pea gravel over the soil. The sharp edges of the gravel hurt the pads of their feet which will deter them from digging.